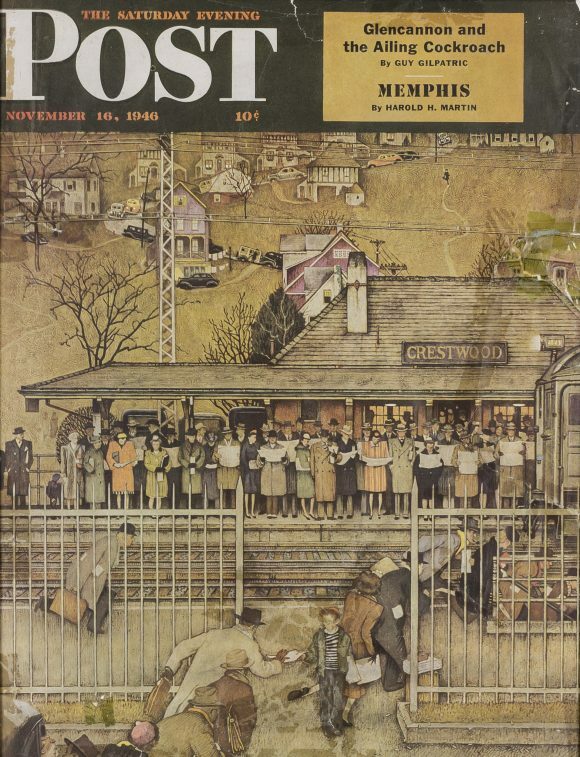 The Hilbert Museum of California Art at Chapman University has acquired a large and highly detailed Norman Rockwell pencil drawing, “Crestwood Commuter Station,” created in preparation for one of the artist’s iconic “Saturday Evening Post” covers in 1946. The work will go on display to the public in a new exhibition at the museum that puts it in context with Rockwell’s other cover artwork created during his 47-year professional association with the Post, with a focus on his peak years in the 1940s and ‘50s. The Hilbert Museum is open Tuesdays-Saturdays, 11 a.m. to 5 p.m. The Rockwell exhibition will run through October 19. Admission is free, and free parking is available in front of the museum with a permit obtained inside. The museum is located at 167 N. Atchison St., across from the Orange Metrolink station. For more information, the public can call 714-516-5880. Rockwell (1894-1978), of course, is an artist more closely associated with the East Coast than California, though he did visit the Golden State on many occasions. He lived briefly in Alhambra in the early 1930s, during which sojourn he met and married his second wife. 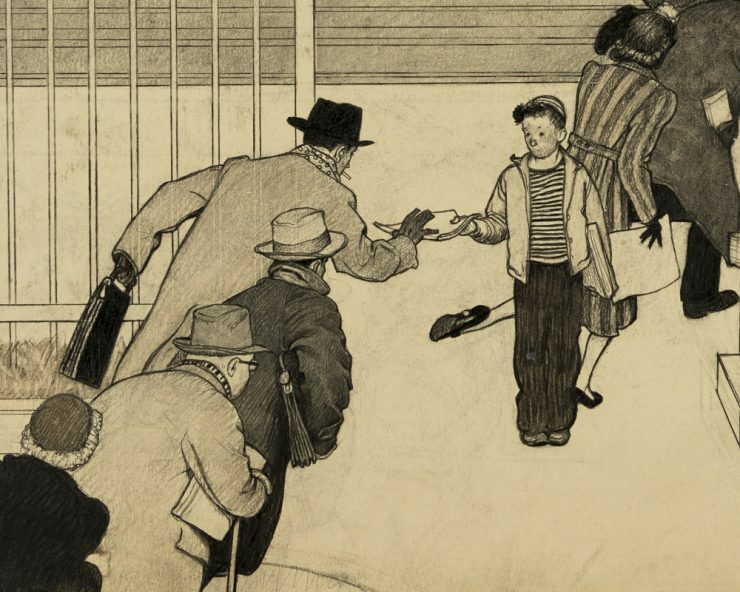 The drawing is a preparation for one of Rockwell’s most beloved works, “Crestwood Commuter Station.” The piece, which ran on the cover of the “Saturday Evening Post’s“ November 16, 1946 issue, is not one of the master American illustrator’s usual close-up character studies. Instead, Rockwell’s artist’s-eye “camera” pulls back to reveal a wide shot of the hustle and bustle of a commuter train station in the mid-1940s. In the illustration, men in hats and women in heels rush to the station underpass and stand crowded on the platform, reading newspapers as they wait for their train. A woman in curlers leans out of a car window to kiss her husband goodbye as she sees him off to work. Front and center, a winsome newsboy vends papers to the passing throng. One fascinating bonus of this drawing is that Rockwell sketched another drawing on the back: a portrait of one of his Vermont neighbors, Colonel Fairfax Ayres. This “hidden drawing” will be displayed as a high-resolution reproduction in the exhibition. “The Hilbert Collection’s newly acquired piece is likely what is called a ‘comp,’ or a comprehensive drawing for the finished piece,” said Gordon McClelland, an art and illustration expert who has curated several exhibitions for the Hilbert Museum. The finished painting, as seen on the magazine cover, is part of a private collection and has been exhibited at the Norman Rockwell Museum in Stockbridge, Massachusetts. Both the Hilbert study and the finished painting appear in “Norman Rockwell: A Definitive Catalogue“ by Laurie Norton Moffatt. Hilbert Museum benefactor Mark Hilbert, who acquired the “Crestwood Commuter Station” drawing for the Hilbert Collection, says that one of the joys of looking at the piece is seeing all the different faces—including, he believes, some famous ones. “There’s a man in a bowler hat, carrying two briefcases, who looks exactly like famous movie director Alfred Hitchcock. And there’s another figure that clearly is a self-portrait of Rockwell himself, right down to the trademark pipe in his mouth.” Hilbert hopes museum visitors might pick out even more hidden celebrity portraits in the drawing. Crestwood Station is a real place. Located in the village of Tuckahoe, New York, it’s the first stop out of New York City on the Metro-North Railroad’s Harlem Line. 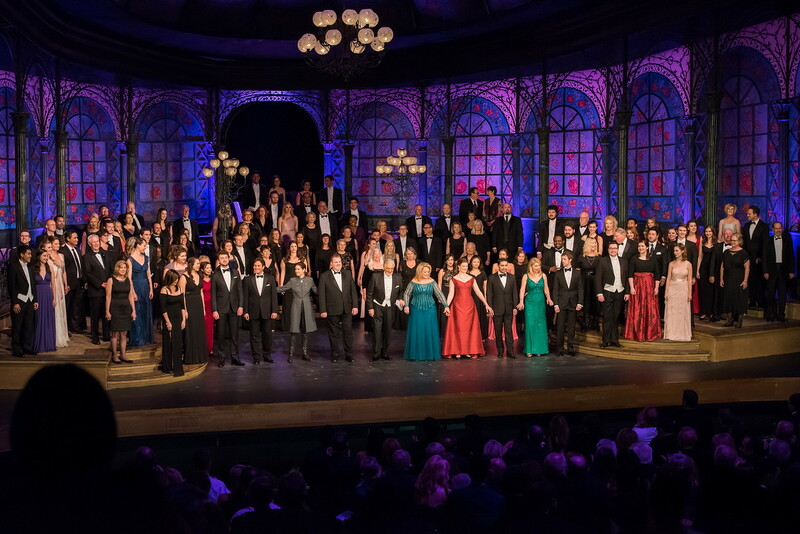 Its name comes from the adjoining community of Crestwood, Yonkers, and it’s still a busy place. Visitors to today’s Crestwood Station, though, would be hard-pressed to recognize the lively, quaint little station in Rockwell’s 1946 portrayal. Recent changes have included a towering, glass-enclosed overpass where the new ticket office is located, while the old station remains boarded-up by the tracks. “Crestwood Commuter Station” was Rockwell’s 242nd out of his 322 paintings published on the cover of the “Saturday Evening Post,” one of the most popular of the mid-20th-century mass-audience magazines. His career with the Post spanned 47 years, from his first cover in 1916 to his last, a portrait of John F. Kennedy following the president’s assassination, in 1963. Rockwell is one of America’s best-known artists. “If you ask someone to name an American illustrator, often the only one they can think of is Norman Rockwell,” says Platt. “Of all the great ones, he’s the only household name.” Part of that is due to the clever way the Rockwell organization has marketed his works, with reproductions still churned out on calendars, coffee mugs, umbrellas, t-shirts and many a coffee-table book. But part of it, too, is his deft hand, effortless ease of color and line, and the genuine joy he takes in his subject matter. While some prominent art critics turned up their noses at Rockwell during his lifetime, calling his work sentimental or too commercial, recent articles and exhibitions have taken a more admiring look at this iconic illustrator, praising him for his immense skill as a figurative and narrative painter and for his keen social observation. Many of his paintings have hit auction records, such as “Saying Grace,” selling for $46 million in 2013. His paintings are regularly snapped up at lofty prices by celebrity collectors like George Lucas and Steven Spielberg. Born in New York City, Norman Rockwell (1894-1978) began his art studies at the National Academy of Design and later attended the Art Students League. Like his contemporary Walt Disney, Rockwell’s particular genius was in portraying a sincere and heartfelt appreciation for America and the American way of life. “Without thinking too much about it in specific terms, I was showing the America I knew and observed to others who may not have noticed,” Rockwell said of his work. Rockwell painted his first commissioned pieces, a set of Christmas cards, when he was just 16, and became art director of Boy’s Life magazine while still in his teens. At 21, he moved to New Rochelle, New York, where a number of famous American illustrators, including J.C. and Frank Leyendecker, had studios. After painting covers for several other magazines, Rockwell received his first commission for a Saturday Evening Post cover in 1916, at the age of 22. Rockwell married, divorced, moved briefly to California and married again. He moved his little family to Arlington, Vermont in 1939. The 1930s through the 1950s are considered to be Rockwell’s most fruitful artistic years, as his themes shifted to small-town American life and its characters. In 1943, Rockwell, inspired by an address by President Franklin Roosevelt to Congress, painted “The Four Freedoms.” “Freedom from Want” (the famous “grandma serving the turkey” painting), “Freedom of Speech,” “Freedom to Worship” and “Freedom from Fear” were published in successive Saturday Evening Post issues. The illustrations became enormously popular and toured the U.S. in an exhibition sponsored by the Post and the U.S. Treasury Department, raising more than $130 million for the war effort. The Rockwells next moved to Stockbridge, Massachusetts, where he continued his prolific production of illustrations. In 1963, he ended his nearly five-decade association with the Saturday Evening Post (his final painting and went to work for Look magazine, where the themes of his works spanned issues ranging from the war on poverty to civil rights to space exploration. In the 1970s, he established a trust to preserve his artistic legacy and founded the society that would later become the Norman Rockwell Museum. He passed away peacefully at his home in Stockbridge in November 1978, at the age of 84.